Watch as the map above animates Hurricane Maria's path, the cumulative precipitation the storm dropped on the island, and the impact of rainfall on river gage height. New data are added every six hours. Hydrographs in the right panel show normalized gage height at the 24 U.S. Geological Survey (USGS) gaging stations that are used by the National Weather Service to forecast flood conditions. The USGS's robust streamgaging network, which held strong against the pummeling of Hurricane Harvey and Hurricane Irma, was not immune to Maria's extreme conditions - see “x” markers appear when data were lost, conditions were beyond gage operating limits, or instruments were damaged. The hydrographs vary in shape due to differences in stream size, storm surge, reservoir operations, and other local conditions. The USGS has more than 8,200 permanent gaging stations across the country; 24 are represented in this visualization. The USGS collects additional information with Short-Term Network sensor deployments. When gages are damaged in a storm or when gages are needed in particularly vulnerable areas, the USGS can build robust structures to protect equipment and ensure data integrity. A recent example of where that practice was particularly important was along the coast of Texas. For example, the Brazos River near West Columbia, Texas was built up on a stand to help prevent the instruments from getting wet. 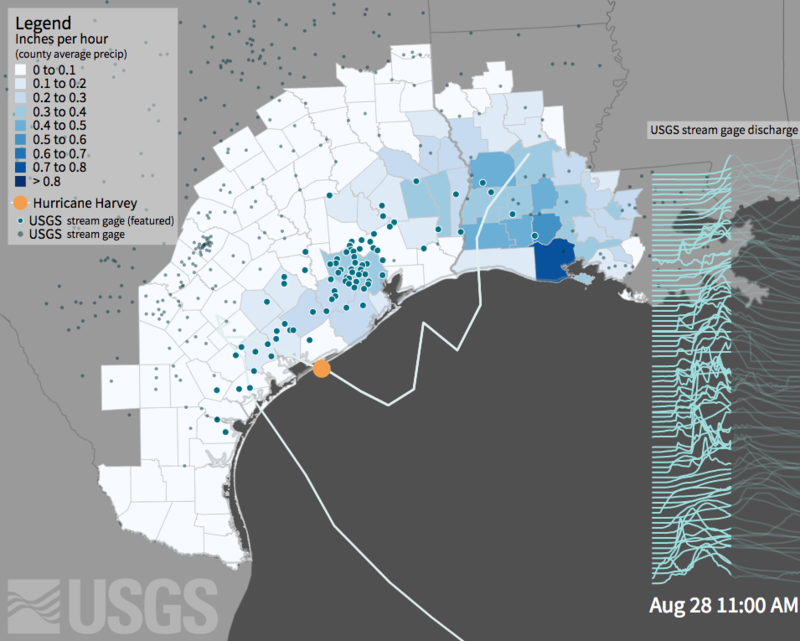 Hurricane Harvey flooded the area with over 25 feet of water that remained for over five days but the instrument continued transmitting situational awareness data for the flood conditions. 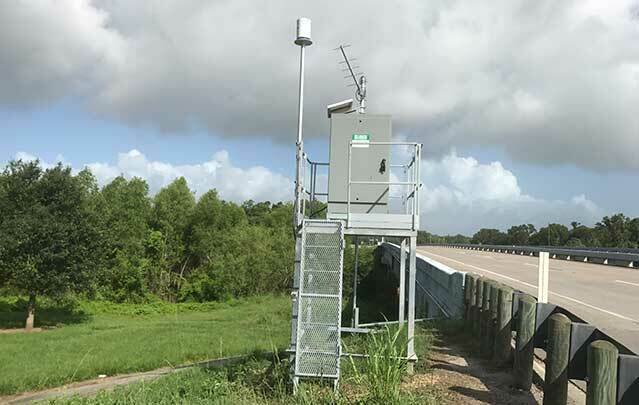 Flood gage installed this year at Brazos River near West Columbia, Texas. Gage is up on a stand to prevent the instruments from getting wet. May 2017. 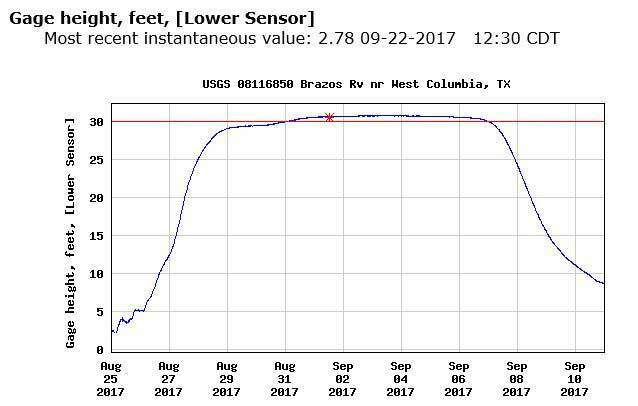 Water level graph for USGS Site 08116850 Brazos River near West Columbia Texas during Hurricane Harvey, August 25-September 11, 2017. More information about water science in Puerto Rico can be found at the Caribbean-Florida Water Science Center. Gage Height: U.S. Geological Survey National Water Information System. Time series of gage height at sites with National Weather Service flood stage information are shown through time, ordered by longitude and normalized to site-specific maximum gage height observed over the duration of the animation. Precipitation: National Weather Service River Forecasting Center multi-sensor (radar and rain gauge) precipitation estimate shapefiles aggregated to a complete grid for the hurricane. Storm Track: National Oceanic and Atmospheric Administration National Hurricane Center Preliminary Best Track for Hurricane Marie.